Here we go again. Last year we attempted to go to Alaska, only to have the motor blow up in Pleasanton. 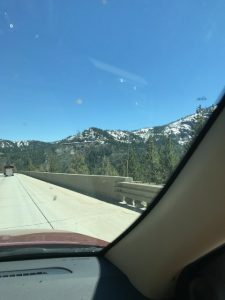 This year we breathed a sigh of relief as we passes the carman, where we were stranded. The month before we were to leave the jeep sprang a leak, and spewed coolant onto the highway. I brought it back to the dealer, who took two weeks to get a hose and install it. The day before we left, the Jeep threw a check engine light for the glow plug on the number three cylinder. I wasn’t sure we’d get started, but away we went. 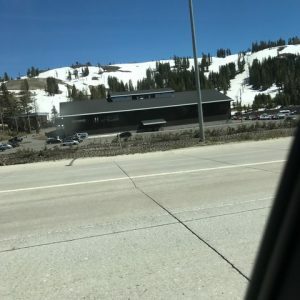 There was a ton of snow on Donner summit They say skying through the summer. The Jeep pulled the trailer up the hill at 55 the whole way. I was impressed. 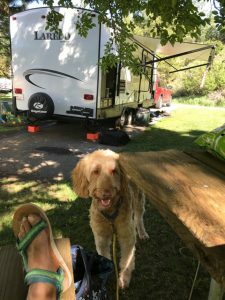 The Truckee river RV park was nice. Plenty of shade. 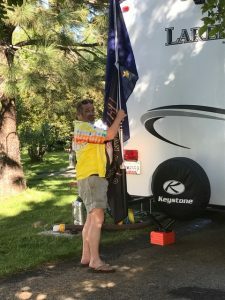 Raising the Alaska and of course the Giants flag.